S.T.E.M. Education: The first hour the students participate in one of our seven S.T.E.M. lessons which demonstrate the relationship between S.T.E.M. and roller skating. 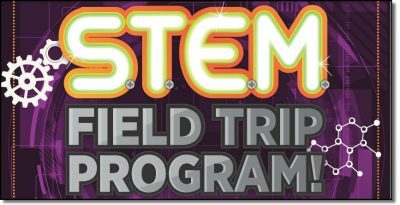 Students will learn S.T.E.M. concepts in an interactive and entertaining way, enhancing learning. The S.T.E.M. portion of this program is instructed by a trained, experienced educator who is very knowledgeable on S.T.E.M.’s relationship to roller skating. Some of the topics covered in the S.T.E.M. lessons are motion, force, friction, sound waves, Doppler Effect, light waves, design and geometry. All lesson plans are copyrighted and meet New Generation Science Standards and Common Core Math Standards. All lesson plans are taught by a licensed educator here at Ozaukee Skateland. 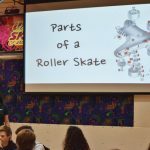 You might be asking, what can a roller skating rink teach children about math and science? The answer is simple, and its more than you can imagine! We roll around on wheels, fill the area with lights, deal with gravity and physics when we aren’t centered, use computers for music, get exercise, and so much more! The Science of Roller Skating: Just rolling around, you can learn about friction, acceleration, velocity, and rotation. You learn about the technology that goes into skate design and protective gear. We learn about the engineering behind skate assembly and design, from wheel materials to kingpin angles. We learn concepts like friction, kinetic energy, inertia, along with some product design. 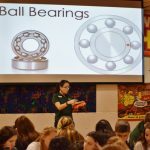 Acoustics and Rink Design: Its time to learn about music. We see what music really is, which is waves, and how they move through a medium. We see wavelengths and how they affect sound and pitch, and learn the Doppler effect. We teach sound reflection and echo, as well as units of sound, the decibel. We learn about types of speakers, and how echo and reverberation make a difference in speaker placement. Science of Lighting: We learn what makes light do what it does. We learn how waves make up different colors on the electromagnetic spectrum, and how our friend Roy G Biv is the visible light spectrum. We talk about the speed of light vs the speed of sound. We show the different types of lights that are used at our rink. We cover lasers, how they are made, and how they are different than regular lights. We even cover the pythagorean theory to figure out how high to hang our lasers. Heart Health: We learn about exercise and how many calories you can burn roller skating. We get our hearts beats per second, then apply some exercise, then take our pulse again. 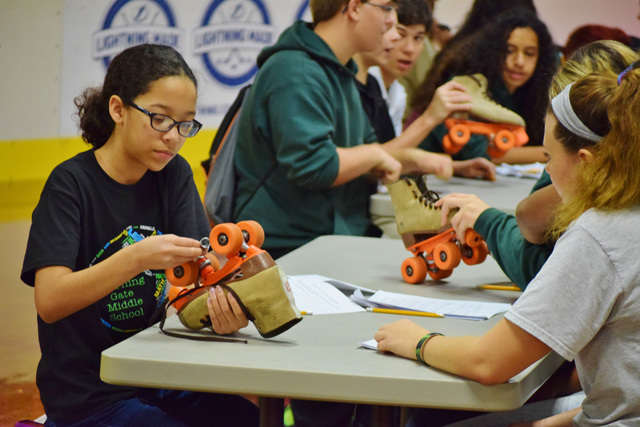 Some students will use math to calculate how many calories they would burn in a regular skating session. Formulas, Fractions, and Fun: We learn why math is important, and how it is used in everyday life. What would life be like without mathematics, and why everything in the world depends on math. How does mathematics apply to roller skating? 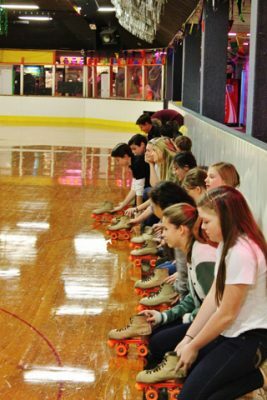 Try building your own roller rink! Learn how geometry and shapes make up your skating floor. How big does the skate building need to be? Lets measure motion, and see how fast we can go, and far we can go. We can even calculate how far we can skate in a certain time. Remember, these are just some of the sections and topics that are covered. There are many more that are not listed here, and another thing to remember is that each of these lesson plans are tailored for the grade of the student. 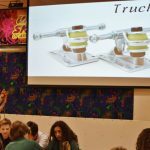 Older students won’t be bored with simple concepts, and younger students wont be overwhelmed with complex topics. Call us today for more information or to schedule a field trip, or to have us come to you to give information, just ask! Lesson plans have to be delivered at the skating rink.